Regular readers of this blog will be aware of the extremely long-running saga of the Caley Jumbo 0-6-0 which occasionally (dis)graces these pages. With the body on, it’s still somewhat hesitant to move which I’m happy to put down to unresolved clearance issues inside the body that need located and dealt with. Remove the body however and the situation is still poor – the chassis is reluctant to start even when unburdened by the metal superstructure and requires a heavy starting load on the controller to get it moving, just like crap 1970s/80s RTR with poor quality Ringpiece (sic) motors in over-scale tenders. I guess that if I leave it aside for a bit I can return refreshed to the model and identify a solution. This brings me to the point of this entry; this kit retains only the superstructure of the loco. The reason for this being that I have had to source suitable frames and rods for both loco and tender along with various smaller fitting. 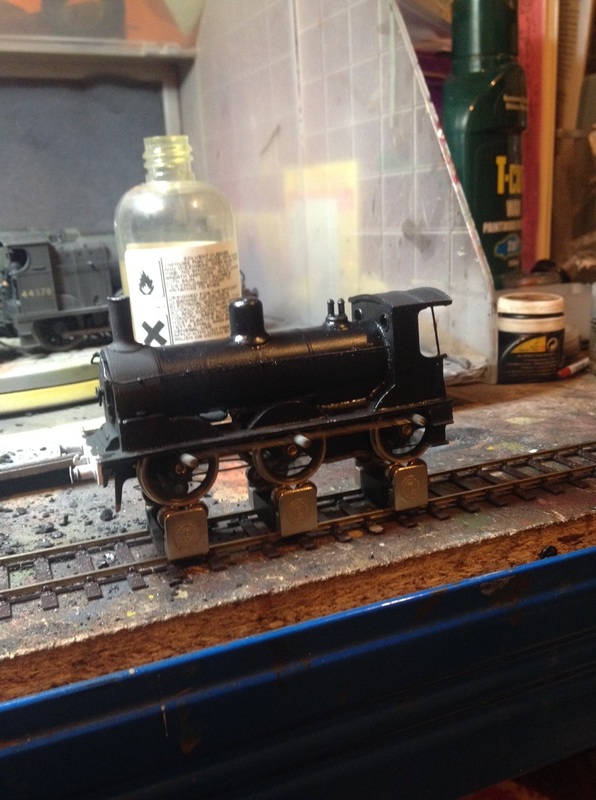 While the construction of the running gear for this loco has been an unashamed comedy of errors, it has taught me several useful things about the finer points of loco construction so while the struggles continue, they provide an education in the practicalities of ‘rolling your own’ and how NOT to produce a kit. The point is that I SHOULDN’T HAVE TO go through the hand-to-hand fighting I’ve experienced with the Jumbo, just to build a commercially available kit (the only one in fact of this prototype). It has turned into a ‘Grudge Build’, I have invested (and probably wasted in honesty) hours and pounds trying to turn this effort into a decent working model. All pleasure has now gone from the process and the only reason I haven’t just jacked it and lobbed the f****** thing into landfill is that I refuse to be beaten; it’s just a bloody war of attrition now and I’m not prepared to throw the towel in out of pride, nothing else. The chassis frames were obviously cut from redundant GWR nameplates, such is their thickness and with spacers and bearings attached it isn’t possible to fit 00 axles! Clearly there was some interesting stuff being smoked in the draughting room that day. In both cases, I ended up supplying my own chassis parts and rods, thereby increasing the expense considerably and generating trials of their own. In the 21st Century, there are some marvellous manufacturers out there producing excellent, well-designed kits with clear and unambiguous instructions produced by someone who as actually BUILT the kits and applied some kind of logic to the process. DJH have a number of these poorly designed and inferior efforts still on the market in 4mm and whilst their 7mm products are, with justification highly regarded, their smaller brethren, sadly fall massively short of acceptable standards. I have in the last four years, built loco kits by NB models, Alexander Models, NBR 4mm Developments, 52F and Finecast. The only two kits I have experienced appalling difficulties with were this and another from the same stable. These ‘Consett Clunkers’ have been around for nigh on forty years and I believe the time has come for them to be packed off to model Valhalla. For someone who greatly admires the Caledonian Jumbos and would build more were a good kit available, it’s a bit disappointing but I will NEVER purchase one of these antiquated, un-buildable pieces of crap ever again. To describe it as a kit in the modern age is a borderline breach of trade descriptions and if you really MUST have a Jumbo in future, trust me, you really would be better off scratch building. Please, for the love of God, somebody produce a decent etched kit of this and the 439. It’ll save at least some folk in the world from heartache and find this abortion a bright new future as boiler and tender ballast! Dave, I wish you would stop waffling and express a definite opinion! You’ve made a damn good show of it this far Dave. As you know I wrote off a three figure investment in my DJH 812 when I saw how much of a turd it was. I reckoned the boiler casting was the only thing worth saving and the rest unusable. As I say, keep the faith, have a break and come back to it with a clear head. Good to know that someone found a use for GWR nameplates. Going well and good steady progress then?! How does the motor and powered wheelset run with the rods off? The NE and Borders group of the EMGS is starting a series of meetings next Sunday on chassis construction. Contact me via. e-mail if you want details. That’s a toughie! joking aside I guess they are of an ‘age’, without them we’d be the poorer. Lets face it they are character building, if you get one together reasonably well its give a huge feeling of achievement and fluffy bunny warmth inside! Grab a Highland Barney from Falcon Brassworks (if you can get them on the second hand market or if they ever produce again). Whilst it is hardly a perfect kit; it is buildable and will produce a workable model and they are essentially the same as a Jumbo as the two brothers definitely ripped off each other’s designs! I have one underway and will get some stuff on my blog in time. True words – you buy a kit of a particular prototype and end more else scratchbuilding! I wish my Dad was still with us – he would have LOVED your blog! He was a keen modeller and frequently used to end up “reworking” kits to the point where he was building from scratch. He did everything from dioramas to remote controlled submarines over the years.